Last week, our seniors took a trip to see the newly completed 9/11 memorial. The newly-opened Memorial is a powerful testament to the most significant world event in our lifetimes that took place just a short ride away from our homes. The program was a moving experience that strengthened the bonds between our students and united them as a senior class. Each student had an opportunity to connect with the event and the memorial itself in a special and personal way. Each senior was assigned a victim of the attacks on 9/11, and was asked to gather as much information as they could about the person. At the memorial, our students gathered in small groups and shared the information with other class members. Each student created a commemorative marking of the victim they researched. The program was extremely moving and special, and the Yeshivah of Flatbush Senior Class of 2012 is honored to have been able to visit and participate in honoring the memories of those lost on that fateful day. 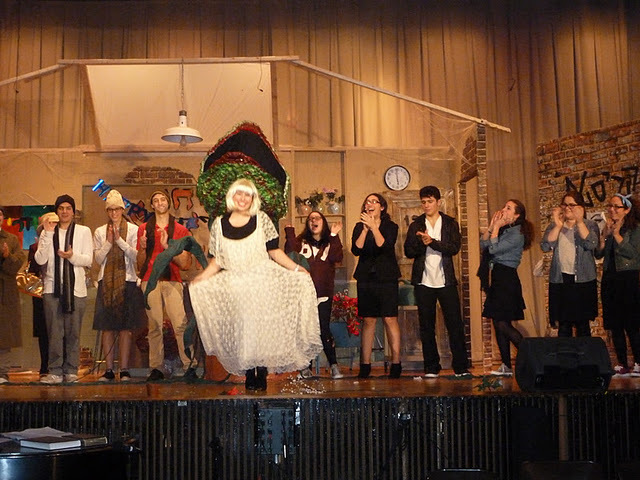 The Yeshivah of Flatbush High School celebrated this Chanukah with a special hebrew production of Little Shop of Horrors as well as a production from both our Choir and Orchestra. It was an experience enjoyed by the entire student body, the 8th grade from the YOF elementary school, as well as parents and colleagues who had the privilege of participating and attending the productions. - James, Alex, Jean and the maintenance crew for building the set and adding their artistic visions to the art and woodwork. - And of course, Ms. Sally Shatzkes for her tireless dedication and professionalism to this production. 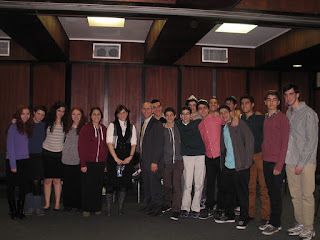 It was an honor and a pleasure to welcome Member of Knesset Tzipi Hotovely to the Joel Braverman High School last week. A member of the Likud party and the youngest member of the Knesset (now 33 years old), she took time from a busy schedule to meet and speak with about 60 of our students from the Israel Awareness Commission, members of the administration and some faculty. She discussed what makes a good leader, seeking answers through Biblical models as well as modern day examples. She also discussed that for Israel to succeed, it needs to follow its vision, not bow to the will of the world. She stressed her view that all Jews, particularly Jewish youth, should be making aliyah now. A doctoral candidate in Law, an orthodox woman serving as the Chairperson of the Knesset Committee on the Status of Women, she proudly represents a fervent and unapologetic Zionist platform, firmly based on Jewish principles and values. MK Hotovely engaged the students and faculty in open and lively conversation, and was truly interested in what they had to say. In turn, for our students and faculty, it was an opportunity to meet a unique woman on the path of playing a significant role in Israel's future. MK Hotovely was in the United States as a guest of the Israel Independence Fund, and was accompanied on her NY visit by its Executive Director Aharon Pulver. Her visit to the High School was coordinated through Rabbi Nissim Elnacave, Jack Mann, Morris Benun, Abe Beyda and Solomon Bendayan. She also spoke over Shabbat at three community synagogues: Beth Torah, Sephardic Synagogue and Mikdash Eliyahu. YOF Vice President Jack Mann, at whose home MK Hotovely had Shabbat dinner, commented, "She is fearless, honest and straightforward. Driven only by principle, she is not afraid to stand alone for what is right." Last week, our school's AP Biology classes participated in two trips to a DNA laboratory. Our students routinely participate in hands on lab experiences that both improve their knowledge of the curriculum, and allow them to successfully complete their curriculum in Advanced Placement (College Level) Biology. On this trip, students visited a professional DNA lab to study restriction enzyme analysis and bacterial transformation. Our students had the opportunity to use important biotechnology equipment, which gave them hands on experience with the tools used by professionals. Special thanks to teachers Dr. Fruchter and Rabbi Lubner for organizing this trip. A special thanks to Mrs. Zakay who joined as a second chaperon. 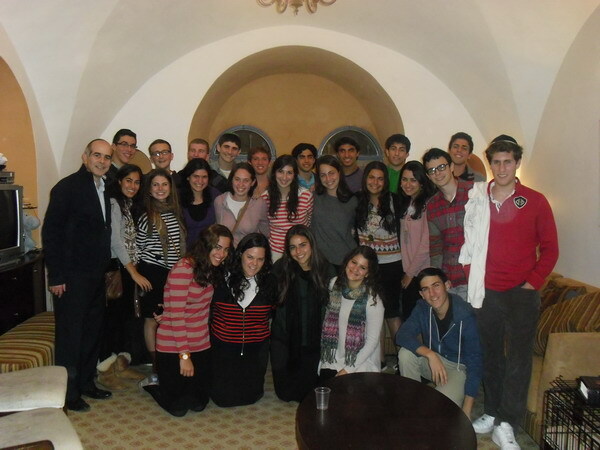 Last week, we sent a delegation of students to participate in an annual Panim El Panim seminar in Washington, D.C. 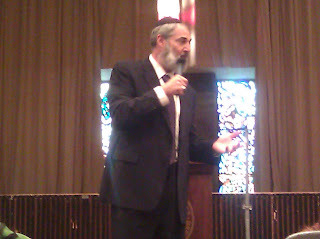 The seminar had approximately 120 students from 7 schools: Hebrew Academy of the Five Towns & Rockaway (NY); Akiva Hebrew Day School (MI); Hillel Community Day School (FL); Yeshivah of Flatbush (NY); North Shore Hebrew Academy (NY); Beth Tfiloh (MD); and the Rae Kushner Yeshiva High School (NJ). Our students were split into two groups which discussed different topics throughout the seminar. Some students chose to learn more about the U.S./Economy and Occupy movements, and some chose to discuss the Arab Spring and U.S./Israel policy. In both cases, the students had opportunities to discuss policy with senate and house representatives, participate in service components and volunteer for charitable organizations as well as listen to experts debate the topics at hand. Students on this trip had the opportunity to participate hands on in research, lobbying and overall political activism and awareness. Special thanks to Mrs. Marcus and Mr. Engel for chaperoning the trip. Congratulations to Michelle Sabbagh, winner of the iPad2 raffle conducted by our Spiritual Growth Commission as part of a Berachot Contest! 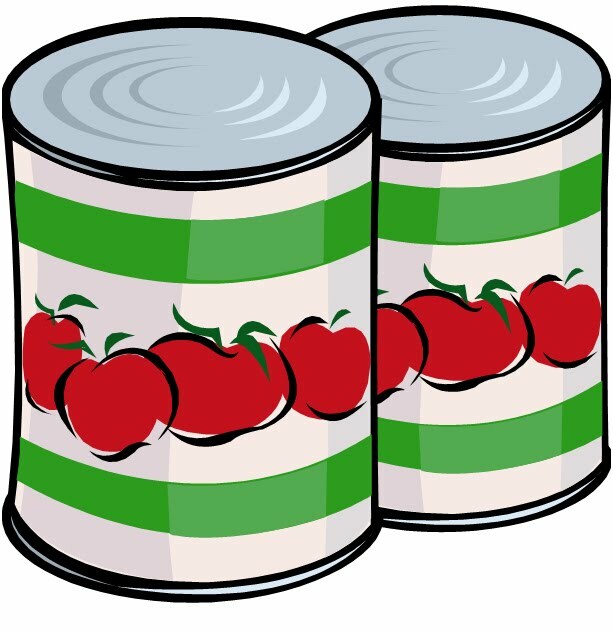 We are collecting all types of canned food for the SBH food pantry. 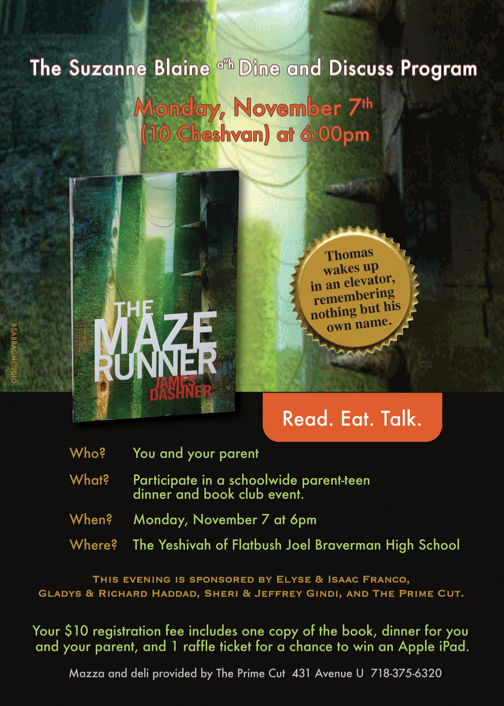 The drive is being held on Rosh Chodesh Tevet: Tuesday, December 27th/1 Tevet. 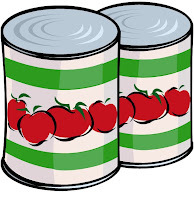 Please bring in cans. We need all the cans we can get!! Please join in and help out! 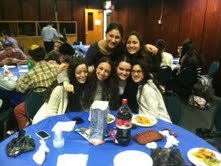 On Wednesday December 21, the Senior Council put together a Chanukah program for the 12th grade. 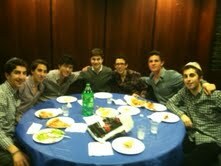 The evening began with mincha and arbit, and continued with wonderful entertainment, a Dvar Torah and dinner. Featured performers: Rabbi Beyda, Rabbi Benlulu, Joseph Khezrie, Ezra Hochman and Steven Burekhovitch wowed the crowd with their own version of Adam Sandler's Hanukkah song. All of the seniors were assigned "secret Maccabees" for whom they bought a small gift. The gifts were exchanged over a Pizza Time dinner, sponsored by our Senior Council, that everyone enjoyed. The program was a big success!! We would like to thank our master chef: Jaime Shamosh. To make the dough: Mix the dry ingredients in a Cuisinart and then slowly add butter, water,and oil. To make cheese filling: Mike eggs with grated cheese. Form dough balls with the dough, and cheese balls with the cheese filling. Take dough ball and dip it into sesame seeds then press it in the tortilla press to make it flat. Add cheese ball to center of dough and then pinch to close. Our students are very involved with AIPAC (The American Israel Public Affairs Committee) and recently hosted our second annual AIPAC Symposium for students from different schools across the tri-state area. We thank all the members of the Israel Awareness Commission who made the symposium a very successful event. We are proud to say that AIPAC has recognized their efforts in their most recent Publication: the High School Activist. AIPAC-trained students at Yeshivah of Flatbush Joel Braverman High School in Brooklyn, NY organized an intensive, 4-hour political leadership seminar, which was attended by more than 150 students from eight Jewish high schools in theNew York tri-state area. AIPAC Early Engagement Director Eric Gallagher, AIPAC Senior National Field Organizer Michael Citron, and AIPAC-trained activist Joey Cohen-Saban led sessions focusing on current events in the Middle East, Capitol Hill, and how students can involve themselves in the American political process. As a result, students are already planning to engage their elected officials. Many Yeshivah of Flatbush students, parents, alumni, and faculty crowded into the school early this past Sunday morning for our Sunday Morning Learning program. Sunday Morning Learning is an extracurricular Torah learning program that is held once a month. The program starts off with Tefilah at 9:00 am followed by a delicious breakfast. After breakfast, students gather in Chavrutot to study the sources that will be discussed in a shiur that follows. The shiur is an exciting lesson given by a member of the Flatbush faculty. The most recent shiur was given to us by Ms. Julie Anzaroot, one of our beloved teachers. Her shiur was inspiring and interesting. This week's Program was dedicated in memory of Taly Greenfeld Cohen & Daniel Chernikoff by the Hanon family. On Saturday night, December 3rd, the Yeshivah of Flatbush dance team competed in Hillel Yeshiva’s Rikudiah Dance Competition. Hillel, Magen David, Illan, Shulamith, Kushner, Frisch, and the Yeshivah of Flatbush competed in this Rikudiah, and Flatbush proudly placed second. Captains Barbara Dayan and Kimi Hamadani and the rest of the team organized practices Tuesday and Thursday nights as well as Sundays. Sheri Torgueman and Barbara Dayan choreographed the team’s four-minute dance that performed at Hillel Yeshiva. The dance ranged from lyrical and hip-hop to Kimi Hamadani’s tap dancing. In placing second, the team was awarded a sum of money to donate to the charity of their choice. Since the competition was held in Hillel, the team decided to give the money to the Jherin Gorcey A”H Foundation which is raising money for a Mikveh and a girls’ Bet Midrash in Eatontown; Jherin Gorcey A”H was a Hillel High School student who passed away last year. The Yeshivah of Flatbush dance team will be hosting its own second annual dance competition on March 18th in the Yeshivah. 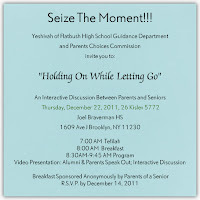 We hope that all girls and women will come to this event to support Flatbush. Wednesday night was our third Cooking for a Cause event, run by our Helping the Hungry commission. The commission cooks for the needy in our community on Wednesday nights, after school. 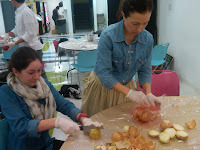 Students learn to prepare a variety of entrees, dinners, and desserts while participating. All of the food prepared in these events are sent to needy families who can then enjoy delicious homemade dinners. For more information about this commission, read this previous post: http://www.myflatbushlife.com/2011/10/helping-against-hunger.html We would like to thank our master chef Robyn Dweck assisted by Lisa Klein. Students made over 45 hearty vegetable casseroles! In the spirit of the upcoming Chanukah holiday, the Joel Braverman High School's SGO, with the help of faculty adviser Ms. Rina Zerykier, organized their second annual interschool Battle of the Bands. Kushner, SAR and Flatbush students performed a Hebrew and an English song in celebration of Chanukah. Kushner sang the hit song Paradise by Coldplay and Elijah Hanavi, while SAR sang Miami 2017 by Billy Joel and Ahavat Yisroel. Flatbush sang Yellow by Coldplay and then Salam as their Hebrew song. Each school put on a great show and the enthusiastic audience enjoyed singing along with the bands. We were privileged to have Flatbush alumni Jack Mizrahi, Rena Nasser and the hit band RJ2 participate and judge the performance. All the groups were excellent, but in the end, SAR won the battle. On December 1st-4th, the 16th annual Thomas Hausdorff Memorial Basketball Tournament and Shabbaton honoring our late principal was held in our school. Players from three yeshivah high schools joined our Junior Varsity for the tournament: Akiva from Detroit, Cooper from Memphis, and Kushner from New Jersey. The tournament began Thursday with a wonderful Yachad program and continued throughout the weekend with exciting basketball games, a meaningful Shabbaton and an inspiring closing ceremony. We want to thank all the families who opened their homes to our guests, especially Steve & Michelle Sasson, who organized a beautiful Oneg Shabbat Friday night program with divrei Torah and zemirot; Eric & Suzanne Sasson, who enhanced our Shabbat afternoon with good company and sweet delights; and Steven & Amy Sasson, whose special touch at Seudah Shlisheet made everyone feel like family. Mr. Mike Gelber, Ms. Rebecca Silberman and Rabbi Naftali Besser coordinated the event. Special congratulations go to our great junior varsity team for bringing home the championship trophy. How Do You Solve a Problem Like . . . Iran? Four teams of students representing the Yeshivah of Flatbush recently won highest honors in this year's WordMasters Challenge, a national competition for high school students requiring close reading and analysis of many different kinds of prose and poetry. Participating with 548 school teams from all across the country, the school's ninth graders tied for fourth place in the nation in the year's first meet, held in October, while its tenth graders tied for seventh place, and its eleventh and twelfth graders both placed first in the nation. The teams were supervised by Shifra Hanon. Several of the school's students won high honors for individual achievement as well: Sophomore Sam Franco, Juniors Hymie Anteby, Norman Greenberg and Rivka Last and seniors Yaron Marciano and Eliana Schwartz all earned perfect scores in the meet, while in the entire country only 25 tenth graders, only 10 eleventh graders and only five twelfth graders did so. At the same time, freshmen Joey Cohen, Florence Dweck, Sara Natkin, Rebecca Zami and Shani Zenilman, sophomores Andrew Hirsh, Bob Husni and Albert Mishan, Juniors Rachel Erani, Jessamyn Sutton and Tali Zenilman placed, respectively, among the 65 highest-scoring ninth graders, the 108 highest - scoring tenth graders, the 32 highest-scoring eleventh graders, and the 36 highest-scoring twelfth graders nationwide. More than 54,000 students from across the country (and from four foreign nations) participated in the meet. This past week, our Rosh HaYeshivah, Rabbi Dr. Raymond Harari, visited our students who are spending a year of study in Israel. 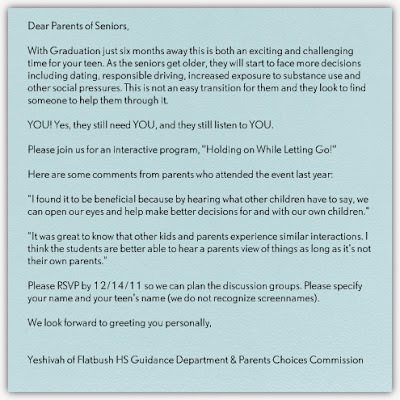 Rabbi Harari noted that it was wonderful to see our former seniors adjusting to their new environments and growing intellectually, emotionally and religiously. They had an inspiring reunion in the home of Dr. Rochelle Dweck. The atmosphere was warm and engaging, and infused with the unique Flatbush spirit. The students shared thoughts, and stories with each other. It was truly an inspiring day. 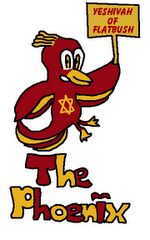 We are looking forward to much nachat from our students throughout the school year and beyond. This Monday night, students, teachers and parents got together for our second annual Dine N' Discuss. Students and their parents both read The Maze Runner for this special evening. We were treated to a delicious dinner presented by The Prime Cut, where students and parents were able to mingle and discuss their initial impressions of the story. After that, students and parents split up into groups for parent facilitated discussions on the novel. It was wonderful to see our students and parents connecting and enjoying meaningful discussions about literature. The second annual event was in memory of our dear teacher and friend Mrs. Suzanne Blaine A"H.
We would like to thank our generous sponsors: Ami and Ralph Sasson, Rochelle and Eli Dweck, Gladys and Richard Haddad, Elysse and Isaac Franco, and Sheri and Jeffrey Gindi. As well as the wonderful volunteers and committee members that made this night possible, especially: Maggie Betesh, Sarah Khdideh, Ami Sasson, Rena Ashear, and Celia Gindi. On October 31, the junior varsity and varsity girls basketball teams played against Central High School for a thrill packed double header. Flatbush took home the win in both games, with scores of 43-37 Varsity and 43-16 for the Junior Varsity teams. We are looking forward to many more exciting games throughout the year! Stay tuned! 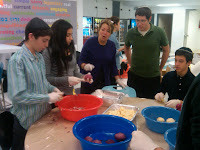 On Sunday November 6th, 9 Cheshvan the first Sunday Chesed Day program of the year took place. Thirty students and twenty adults volunteered 7 hours of their Sunday traveling to Lakewood, NJ on a very special visit to the special children center. The program consisted of interaction with the special children through music, art, and dancing. Together we were all able to be there for the children and put smiles on their faces. We were able to be a part of the special children family. What made this trip so unique was the combined chesed of parents and children together. Here is one student's response to the trip: My experience at the Special Children's Center was truly amazing. I was touched from the second I walked in. I walked down the hallway and stopped at a Classroom filled with special children. My mouth dropped. I changed within the two minutes of looking at the children. During my time at the center I learned a very important lesson. NEVER EVER take anything for granted NOTHING and to be happy with what I have. At the center I played with the children, sang with them, danced with them, decorated cookies with them, and played pass the present with them. I'll admit it. I cried after a while and realized how lucky I am. Words cannot even describe the experience I had. I will 100% go back again. If anyone is interested in participating in future Sunday chesed programs please contact Rabbi Besser or Rosette Shammah. I was fortunate to be chosen to go with the EKO Commission on Monday October 31st to help clean up the Hebrew Free Burial Association’s Silver Lake Cemetery in Staten Island. I didn’t exactly know what “clean up” meant, but nevertheless I was excited to be doing something that combined the importance of caring for the earth together with chesed. Before we left, we had a brief introduction to the association and about what we would do at the cemetery. What I learned about the Hebrew Free Burial Association made the trip all the more meaningful. The HFBA is not a typical burial society. It is a non-profit group that handles the burial of Jews with little or no family, and/or that don’t have enough money for a burial. They make sure that all Jews receive a prompt and proper funeral and burial - no matter what their financial means are. The alternative would be for the bodies to be buried in an anonymous mass grave. When the association was created at the end of the nineteenth century, the HFBA first provided burials to immigrants, including Holocaust survivors and refugees from the former Soviet Union as well as the impoverished deceased. Because the HFBA provides free burials, they often don't have enough money to maintain the cemetery and hire workers. This is why they value volunteers to help them with whatever needs to be done. I, along with 24 other students, participated in the “clean up” to help maintain the cemetery and allow for the continuation of an extremely special mitzvah that the HFBA is based upon, Chesed Shel Emet, Chesed towards the deceased that cannot be repaid. We raked leaves and brushed snow off the ground around the graves, and collected fallen branches and parts of trees. It wasn't easy (or clean) work, especially in the very cold weather, but it was more than worth the effort. Even though we only worked for two hours, not only did we make a physical difference in the cemetery's appearance, but also it also affected us emotionally. The people who run HFBA dedicate their lives to taking care of those who have no one or nothing to take care of them when they die. The least we can do is to contribute our time to show our support. I was happy and proud to know that I did something worthwhile and I know everyone from Flatbush felt the same way. It was an incredibly rewarding experience to be part of the amazing mitzvah of Chesed Shel Emet. Today the SGO hosted the annual Commission Fair for all of our students. The commission fair provides students with an opportunity to explore their interests and hobbies by learning about and signing up for the plethora of commissions, clubs, teams and groups that our school has to offer. From performing groups to athletic teams to academic clubs - a wide range of activities are a available to fit a wide range of student interests. Some examples of the student activities that were displayed include: the Chessed Commission, the Chess Team, the Peer Tutoring Commission, the Investment Club, and even the EKO Commission who are committed to making the Yeshivah and our community as eco-friendly as possible. 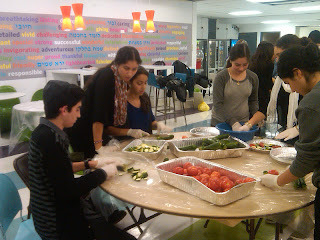 Most of our students are involved in multiple student activities, which enriches their Flatbush experience. This week, the Yeshivah orchestrated a wonderful Freshman induction program over the course of two days. 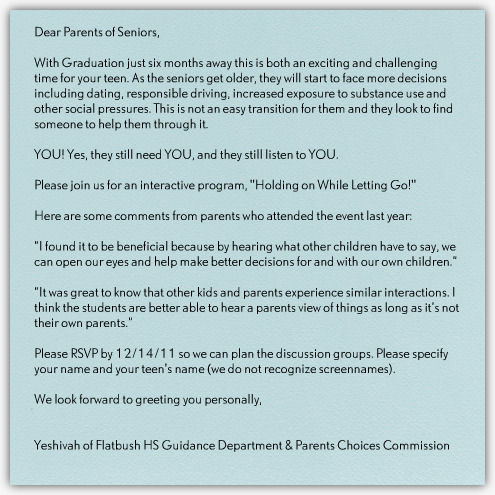 Comprised of both Freshman Night and Freshman Day, these programs are designed to help freshmen acclimate to the unique culture of the Yeshivah. On Freshman Day, the students had a chance to spend a day in the park playing around, competing in races and contests, eating lunch and even fishing. The students got a chance to meet students who are not necessarily in their class or their normal group of friends. By the end of the day, everyone had a really great time and had lots of fun. Many also made new friends. When the day was over, one freshman summed it all up by saying, "These past two days have been great! I am looking forward to spending the next four years together with my grade in Flatbush!" Alan Shlomo Veingrad, former NFL Offensive Lineman, shared his story of being the only Jewish player on the Super Bowl XXVII World Champion Dallas Cowboy Team with all of our students. He captivated us with a moving representation on how he found Hashem and moved toward a life of torah and mitzvot. 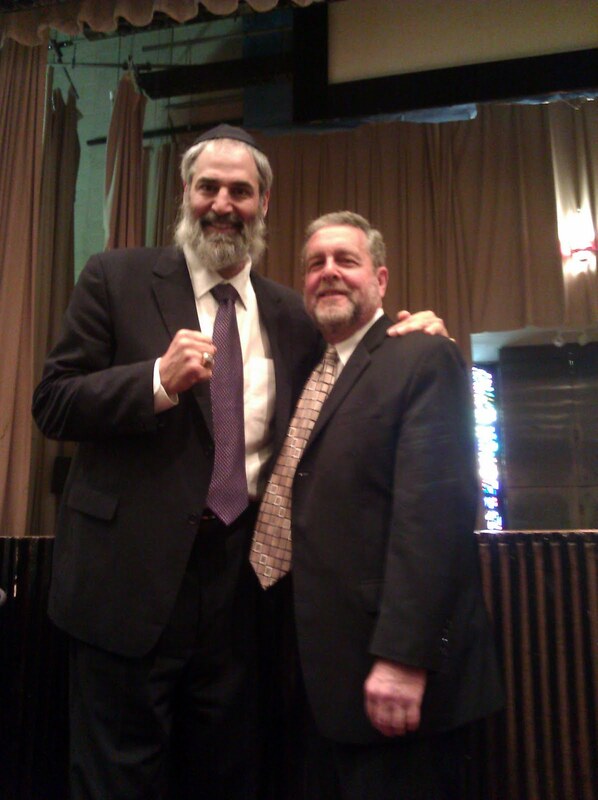 Alan stood before our students in a beard, suit and kippa along with his Super Bowl XXVVII ring. He discussed how and why he made the choice to leave behind the life of materialism and fame to find true fulfillment in becoming an observant Jew. The program resonated with all of us, especially during this month of Elul, as we examine our lives and evaluate what is most important to us in preparation for Rosh Hashanah and Yom Kippur.